Jobs that require climbing utility towers or other structures are ideal uses for automation. Apellix has developed its four-part Worker Bee system to address infrastructure needs. If robots are best suited for jobs that are too dull, dirty, or dangerous for humans, why are people still dangling alongside power-relay towers, ship hulls, or skyscrapers? One company is working on a platform as a service for infrastructure inspection and maintenance. “We want to move workers off of scaffolding and away from towers,” said Bob Dahlstrom, founder and CEO of Jacksonville, Fla.-based Apellix, which is developing a robotic system to improve worker safety. He noted that 95 climbers working on industrial towers died between 2004 and 2012 in the U.S.
“There’s no reason why we should have to send a person down a manhole or up a tower to work with hazardous substances when we have robots that can do it,” he said. Climbers working on towers have a fatality rate that is 10 times that of construction workers, and drones could help reduce those fatalities. The Worker Bee platform consists of a mobile base station, an umbilical cord and a tether, an aerial drone, and software. The base station includes computerized controls, compressor, and materials such as paint or cleaning fluid. The umbilical cord is a hose to convey material, and the tether provides power. The unmanned aerial vehicle can be loaded with a variety of sensors and attachments like paint applicators. “A good example is some hobby drones, where you can press a button to make them do a loop, which could otherwise require hours of practice to do successfully,” he noted. 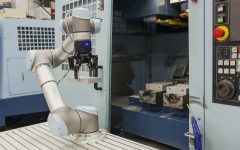 “Going back to the sensors, they could detect hot spots or corrosion invisible to the human eye, adding to the value of robotic inspection,” he added. Apellix has been working on its offering for about a year and a half and is now on the fourth generation of its product. The earliest proof of concept was a relatively simple off-the-shelf wireless drone. The next generations added the hose, the UCAT (umbilical cord and tether) component, and a high-pressure, low-volume (300 psi) applicator. The fourth generation of the Worker Bee maintains 3,000 psi and can currently reach three stories. “We’ve filed for patents,” Dahlstrom said, acknowledging that bigger drones could eventually provide more lift capability. Can Worker Bee function in high winds? “Our preproduction systems have functioned in winds up to 26 mph, but beyond that, we need to be close to a building for application, not because the drone can’t handle the wind but because spray, transfer efficiency goes down,” said Dahlstrom, who worked his way through college painting houses. 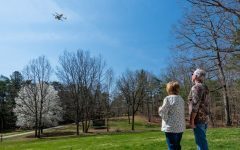 The drone models currently being tested include a spray-painting drone system, a window-washing drone system, and a pesticide/herbicide drone system. Apellix also hopes to improve the quality and environmental sustainability of the coatings industry. For instance, Dahlstrom said, the Worker Bee system could be used for de-icing aircraft. De-icing aircraft is a difficult and hazardous job for humans but good for drones. Currently, workers have to go out in bad weather wearing hoods, googles, and other protective gear to spray toxic chemicals. “But if a drone knew the conditions, could acquire data, and then apply the database, we could use less material, collect and recycle less, and expose people to fewer chemicals,” he said. Dahlstrom said that the Federal Aviation Administration’s changing regulations will probably affect his business, although he expects commercial exemptions or permits to apply. “We fall between traditional regulations on drones and tethered aircraft with limited range, and it depends on where you’re operating,” he said, acknowledging that airports, urban skyscrapers, and factories and warehouses are all different use cases. Japan’s aging workforce and the demand for tower inspections led the utility company to look for partners. “We have letters of intent from service companies that do the painting for shipbuilders,” he added. Worker Bee could also be used both inside and outside warehouses. According to the International Warehouse Logistics Association, more than 4 billion square feet of warehouse walls need to be maintained in the U.S. alone. In addition, the Worker Bee system could eventually be used for smaller businesses and even homes. “[First], we want to focus on industrial safety such as large towers, ships, above-ground storage tanks, etc., but we hope eventually to enter the market for professionals who service the residential and smaller commercial markets,” Dahlstrom said. “We feel these users would benefit from the experience we gain and the modifications and updates we make to the system by first servicing industry and infrastructure,” he added. Apellix is open to investors, Dahlstrom said. “We’re looking at the third quarter of this year to come to market,” he said. CyPhy Works Takes to the Skies Over Japan, the U.S.